Cambridge IGCSE® Computer Science Revision Guide follows the Cambridge IGCSE® (0478) and O-Level (2210) Computer Science syllabuses. 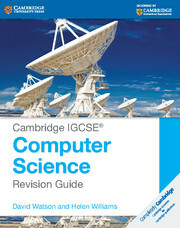 Cambridge IGCSE Computer Science Revision Guide follows the Cambridge IGCSE (0478) and Cambridge O Level (2210) Computer Science syllabuses, matching the syllabus for examination from 2015. The book instils confidence and thorough understanding of the topics learned by the students as they revise for examinations, and is written in a clear and straightforward tone to assist learning concepts and theories. This revision guide is endorsed by Cambridge International Examinations. Clearly written content and detailed explanation of topics gives students confidence in understanding complex subject matter. Tasks and examples allow students to check and test their knowledge of the subject. Practice exam-style papers to help students with preparation.